The 9-Up, or Beam me Up, Scotty! The history of American soft drinks is not nearly as predictable as you might think. Before the advent of soft drinks, potions and nostrums were limited to substances which would self-preserve, without the contents being under pressure, or saved from spoilage by refrigeration. Alcohol will "keep," but most other organic ingredients quickly "turn" and go sour or rotten unless something is done to lower their temperature or keep the air and impurities out. The Wikipedia entry for the commercial soft-drink 7 Up provides a nice summary of how the innocent sweet drink we all know today evolved over the 20th Century. (As a child, I consumed unconscionable amounts of this stuff, along with Byerly's Orange, Nehi and Squirt.) 7 Up's origination appeared two weeks before the Stock Market Crash in 1929, as Bib-Label Lithiated Lemon-Lime Soda. It contained lithium citrate, a mood-stabilizing drug. Lots of such "patent medicine" products were once marketed as being healthy or promoting a sense of well-being. The company changed hands several times after the war, and is presently controlled by the Dr. Pepper Snapple Group. 7 Up has been reformulated several times over the years. The lithium citrate was removed in 1950. There are various theories about what the name "7 Up" actually means, including theories about the ph measure of the drink, and the atomic mass of the lithium content. It probably doesn't matter, since the name has entered the language, in the same way that Coca-Cola has. Current day 7 Up doesn't contain any fruit juice at all. Some of the previous ad jingles I can distinctly recall include: "You like it, it likes you," "Fresh up with 7 Up," "Nothing does it like 7 Up," "Never had it, never will [caffeine]." The lithium got me thinking about something else. The late poet James Schuyler's break-out book of poems was titled The Crystal Lithium [New York: Random House, 1972], which incidentally was also the title poem of the collection, which had appeared originally in The Paris Review. The poem as set out in long, talky lines, and was a kind of revelation of a certain kind of American Modernist style and image-making. 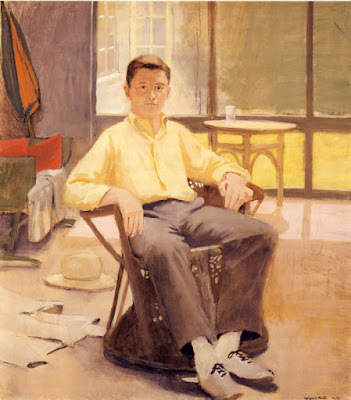 Schuyler was a great friend of the painter Fairfield Porter, and often visited and stayed at his place in Southampton; Porter often made oil portraits of the poet. I'm not sure who first told me what the lithium crystal actually meant--perhaps Barry Watten--but the connection is Schuyler's use of it as a drug for his bizarre mental instability which plagued him throughout his life, and which he wrote about frankly in his work. In his manic phase, his erupting imagination wasn't under sufficient control to allow him to think clearly, but the Lithium, which he took on prescription, allowed him to write effectively, and was the enabling key to his highly admired work in the 1970's and 1980's. The book's title is thus an acknowledgment of the importance of psychoactive chemical influence in the life of a talented creative artist. Schuyler's Freely Espousing [Garden City, New York: Doubleday, 1969], The Crystal Lithium, Hymn to Life [New York: Random House, 1974]. and The Home Book: Prose and Poems, 1951-1970 [Calais, Vermont: Z Press, 1977], were all important to me in my own work as a writer. 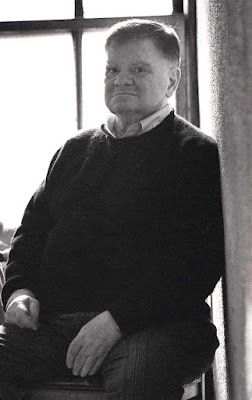 Schuyler's perceptual keenness of observation, his frankness and wit, were revelations to me at the time. This little animadversion is just the sort of distracting detour that I often engage in these days. The internet allows you to wander off into a wood or meadow, off the road of life, and discover or reconfirm something you either hadn't thought about for a while, or hadn't even known existed before. 7 Up, a commercially marketed soft drink, contained an ingredient that would one day be used by psychiatrists to treat patients. And an American poet who was struggling with his personal demons, could be freed of those demons, enabling him to fulfill his ambitions as a writer. All of which, as has been said, "brings us by a commodius vicus of recirculation back to" cocktail mixes and the flavors that can be made from various familiar ingredients. I previously happened upon a taste combination that was suspiciously reminiscent of Coca-Cola. And the one here is suspiciously similar to my memory of 7 Up, which by the way I haven't tasted in many years. In homage to 7 Up and the non-existent lithium citrate, I've christened it the 9 Up. I can't explain why 9, you'll just have to take it on faith. But it's definitely served Up. I can recommend this one whole-heartedly. The coconut seems counter-intuitive--not sure quite why I decided to add it, but it fits in perfectly. The combination of lime and sweet lime is also perfect. One of my best inventions! Enjoy! Shaken and served up with a translucent slice of fresh lime dropped in. Traditionally, the Sazerac is considered to be the official drink of New Orleans, whose history can be traced way back to the beginning of the 19th Century. Because of the French influence, the drink's basis has been considered cognac (or brandy), though variations of it can be made with rye or bourbon with no proprietary fuss. The primary spin of the Sazerac, however, is the absinthe, which, despite the very small amount used, is still the signature flavoring agent. In the traditional Sazerac, you merely swirl the inside of an old-fashioned glass (a squat tumbler with a wider-than-normal diameter), dispose of the excess, and build the drink inside this coated container. For those who don't like the basic licorice flavor, this may be as much as they stand. For those who enjoy it, that little a portion may seem stingy. Back before the recent absinthe revolution, people used Pernod or Herbsaint liqueurs instead of true absinthe, which was banned in the U.S. for many years due to the presence of wormwood, which is the "active" ingredient that produced the symptoms which originally got it into trouble here. In Europe, people still like some Pernod cut with tap-water, producing a milky pale yellow drink that's just about pure licorice-tasting. When I was a kid, we used to chew twisted black and red rubbery ropes of commercially marketed licorice candy--I could stand the red, but the black was so sour and "burnt" tasting, I couldn't eat the stuff. Licorice is used in a number of various common proprietary liqueur mixes (Galliano, for instance). In any event, what I've done here is substitute a good blended (and aged) scotch for the goods, and treated the result as a variation on a classic recipe. 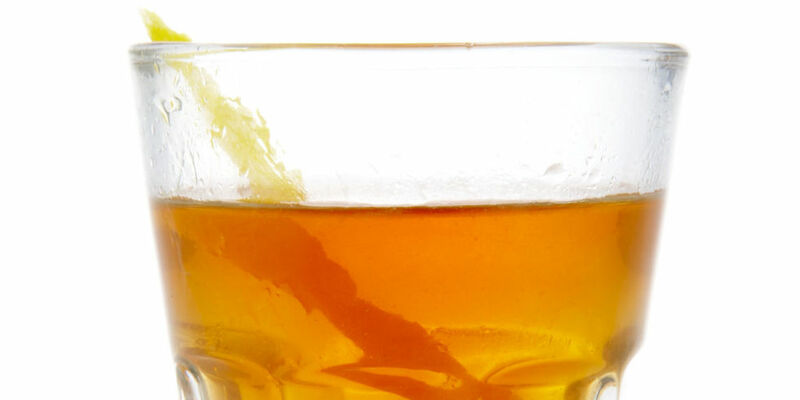 The classic Sazerac recipe is for some simple syrup, dashes of Peychaud bitters, and a lemon peel, with the absinthe swirl preceding. My recipe substitutes blended scotch for the rye or brandy, Grenadine for the Peychaud's, and adds Drambuie and some fresh lemon juice. Perhaps it doesn't deserve to be compared to the classic New Orleans mixture, but it's close enough in my mind to bear a taste similarity. It's been a long season again this year, a year marked by injuries and disappointments, and a few bright spots too. Following last year's triumphant, and improbable, championship run, it might have been expected that some of the propulsion from last year would carry over into this year's campaign. Great dynasty teams--such as the New York Yankees (1947-1964, ten championships, with 15 World Series appearances), or the Cincinnati Reds ("the Big Red Machine," 1970-76 with two championships), or the Yankees earlier (The Babe Ruth Era 1921-1932, 7 Series appearances, 4 championships), or, perhaps most impressive of all, the modern Yankee teams of 1995-2012 (with 17 post-season appearances, and 5 championships)--tend to repeat, but given free agency, it's unusual for all but the richest franchises to keep good teams together for more than a couple of years. Consistently good teams (i.e., the Cardinals, or the Braves, both of whom have had impressive multi-year runs in the last 30 years) are usually the result of superb management and shrewd player manipulation (trades and contracts and farm systems). It's been shown that teams that play the star free agent market usually fail to deliver, while teams that nurture talent through their farm systems usually fair better. Trades can still be crucial to a team's success, but trading "up" can be very risky, depriving a team of significant money it might have used on lesser, but better suited, talent. In the case of the Giants, their core key players over the current run were Buster Posey, Pablo Sandoval, Tim Lincecum, Matt Cain, Brian Wilson, Brandon Crawford, Angel Pagan, Sergio Romo, Joe Panik, Hunter Pence, and Javier Lopez. Of these, all but Pagan, Hunter and Lopez were products of the Giants' Farm System, a fact which speaks to the importance of home-grown talent versus free agent blockbusters. There are two reasons the 2015 Giants couldn't overcome the Dodgers for the NL West title--which presently is in its final stages, with the Giants 8 1/2 games back with three weeks to play. First, the starting pitching. Four years ago, I predicted that Bumgarner would eventually surpass Tim Lincecum as the team's starting ace, and that has definitely come to pass. Lincecum's metoric rise from 2007 to 2010 was not a fluke, but it was evident that, given his slight body,and his tortuous wind-up, he wasn't a pitcher who would have a long career. The two Cy Youngs, and the blazing fast-ball that could strike batters out, were not destined to last. As his velocity declined, he began to press, and lost some of his control. By the middle of 2012, his ERA had doubled, and his strike-out ratio steadily declined. Meanwhile, Madison Bumgarner's star was rising. By the end of last year--and in the play-iffs--it had become apparent that MadBum was a superstar, the kind of player who can carry a team, who performs best under pressure. 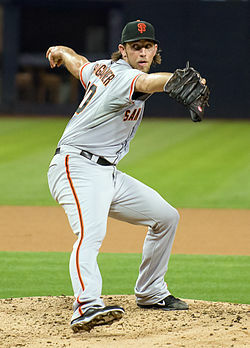 Big, lanky and focused, Bumgarner resembles Randy Johnson, with an easy, slinging motion, a durable body, and a determined bearing (which can't be taught or learned, but seems an aspect of inherited character). Bumgarner has become THE franchise player that every team needs to succeed. If and when he tests the free agency market, the Giants might find it difficult to match a rich team's high offer. But Bum is signed through 2019, so that isn't an immediate issue. After Bumgarner, the picture quickly becomes bleak. The rotation at the beginning of the year was to have been Bumgarner, Vogelsong, Hudson, Lincecum and Peavy. But Peavy quickly went on the disabled list. After a handful of good starts, Lincecum deteriorated, and went on the disabled list. Hudson was intermittently effective, but eventually he too went on disabled. Only Chris Heston, an "old" rookie starter, was consistent. Vogelsong, who was never really a front-line starter, played down to his capacity, as he had in the previous two seasons. When Peavey and Hudson came back from the disabled list, they were ineffective. Lincecum was discovered to have degenerative hip disease. Cain, who had had elbow surgery and had been on the disabled list all year, returned with high hopes but was bombed several starts in a row, and went back on the DA again. As the year progressed, Heston began to falter, so that by mid-season or so, the starting pitching was Madison Bumgarner, and pray for rain. Anyone else on the mound, and the team could expect to begin the third inning of any game down by 3 or 4 runs. Again, for a team not noted either for its speed or its power, expecting a comeback, that's a tall order. Finally, when things seemed to be at their worst, the Giants got Mike Leake, a solid stylish 2nd line starter; however, since coming here, he's gone 0-3 with a 4.71 ERA--not exactly stats which are likely to turn the staff around. All of which accounts for the team's performance in the last several weeks. Second, injuries. Added to the pitching staff's woes, Jeremy Affeldt went on the disabled list, and Romo had intermittent problems too. Romo, who had been last year's closer, couldn't hack it this year, and gave way to Casilla. Casilla was lights out at first, but then he began to get hit hard in the second half. Among the relievers, Lopez and Kontos have been very good, Strickland has been impressive at times (which bodes well for the future--he's only 26). During the year, Aoki, Panik, Pagan, Pence, Blanco, Crawford and Susac have all had significant injuries. None of this of course could have been predicted at the beginning of the year. Being healthy is luck as much as anything. A smart GM should have understood that Lincecum, Vogelsong, Hudson, Cain, Affeldt and Peavy would all be question-marks. None of these pitchers lived up to expectations this year. In another year, I'd expect all these players either to be gone, or retired or doing mop-up relief by next year. On the positive side of the ledger, Matt Duffy was installed at 3rd Base when Casey McGehee tanked, and he's been a revelation at the plate, as well as in the field. Having two miraculous rookies (Panik and Duffy) two years in a row from your farm system is pure gold. We don't even miss Pablo anymore! And now Kelby Tomlinson is showing the same surprising success. In the outfield, Blanco seems to be having his "career year" at the plate, hitting above or just near .300. Aoki was all-star material until he broke his ankle. Meanwhile, Pence (broken arm in spring training and muscle strain in mid-year) has been missing in action. Posey and Crawford are having great years, but neither is a genuine power threat. Pagan, despite missing few games, hasn't been his usual self, nursing old injuries. A good deal has been discussed over the media about the Giants front office decisions and choices. Brian Sabean succeeded with uncanny selections, sticking with tried journeymen, while coaxing along younger players. Not everyone has been happy with Sabean's decisions, but it's hard to argue with success. Three championships in five years suggests "dynasty"--no matter how it's accomplished. Teams which succeed are usually built around a concept. There's the idea that since pitching is "4/5ths of the game" a good squad of hurlers is the foundation of a successful team. Then there's the notion that if you score enough runs often enough, you need only have mediocre arms, as long as your team ERA doesn't get above, say, 4.50. Then there's the theory of the park you play in. Since half your games are played at home, building your team around the potentials of a specific park makes some kind of sense. China Basin, where the Giants have played since opening there in April 2000, is an eccentric park, along the lines of Boston's Fenway (with its weird high left field fence). The outfield alignment creates an unusually deep right and right-center field, which makes hitting home runs to the right side difficult. Dozens of fly balls "die" each year at China Basin, which would in other parks be decent home run shots. When the Giants moved to the park, they had perhaps the greatest modern-day long ball hitter in the game, Barry Bonds. With his power, hitting from the left side, the dimensions mattered less. The left field fence at China Basin is typical, and not at all that deep. Despite this obvious difference, the team has never sought to get right-handed power hitters. Over the last eleven years, no one (even Bonds) has hit more than 28 home runs, and in every case more home runs were hit in visiting parks than at home. Throughout this period, the Giants neglected to avail themselves of any power-hitting right handed batters, with the occasional exception--Moises Alou, Bengie Molina, Juan Uribe, Pat Burrell, Mike Morse. It's true that Posey and Pence are technically power hitters, but as pure power sluggers they have never been considered as such. How much stronger a team would the Giants have been if they'd had, instead of Pagan, or Blanco, a true slugger who could knock in 100 runs with 35 home runs in a year? Typically, the team has tended to structure its outfield for fielding prowess, and that's paid off. But a team which depends on singles and scratching out runs, without some power, especially when it has poor speed, will find it hard to compete without "lights out"pitching staffs. It's fun (or sad, depending on how you look at it), to wonder what might have happened if the Giants had had the courage to go out and hire a 2nd top flight starter (to back up Bumgarner), and if Panik, Crawford, Aoki, Pagan and Pence hadn't all gone down. My guess is that they'd be in first place, but then there's the nagging question of reliable starters. Hudson, Peavy, Vogelsong, Lincecum--these guys weren't up to the task this year, and there wasn't a hell of a lot management could do about it, once they'd made their bets. So it's wait until next year. I wouldn't mind if the Giants trade one of those hot new infielders (perhaps Tomlinson) to someone else for a slugging outfielder with legitimate home run numbers), and they bit the bullet and acquired an ace like Greinke or Sunny Grey. Not signing Sandoval should have given them the money to have done this at the beginning of the year, but then all those injuries weren't anticipated either. But next year will be a different story, with the Lincecum era officially over and the journeymen leaving. We've not heard anything about any good new starters in the farm system, so I would expect the team to shop in the off-season. It will depend on who's available (Greinke will be a free agent), and how astute the traders are. If we want to get back to glory in 2016, there'll need to be some turnover, and a few new faces. Change is in the wind.